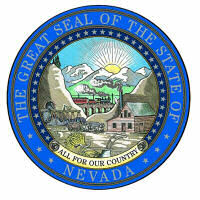 Nevada's official state motto was adopted as an element of the Great Seal of the State of Nevada. The following information is excerpted from the Nevada Revised Statutes , Title 19, Chapter 235, Section 235-010. TITLE 19 � MISCELLANEOUS MATTERS RELATED TO GOVERNMENT AND PUBLIC AFFAIRS. CHAPTER 235 - STATE EMBLEMS; GIFTS AND ENDOWMENTS. 235.010 Contents and design of seal; authorized use; official colors; exceptions; penalty. 1. There must be a seal of the State of Nevada called The Great Seal of the State of Nevada, the design of which is as follows: In the foreground, there must be two large mountains, at the base of which, on the right, there must be located a quartz mill, and on the left a tunnel, penetrating the silver leads of the mountain, with a miner running out a carload of ore, and a team loaded with ore for the mill. Immediately in the foreground, there must be emblems indicative of the agricultural resources of the state, as follows: A plow, a sheaf and sickle. In the middle ground, there must be a railroad train passing a mountain gorge and a telegraph line extending along the line of the railroad. In the extreme background, there must be a range of snow-clad mountains, with the rising sun in the east. Thirty-six stars and the motto of our state, �All for Our Country,� must encircle the whole group. In an outer circle, the words �The Great Seal of the State of Nevada� must be engraved with �Nevada� at the base of the seal and separated from the other words by two groups of three stars each. 2. The size of the seal must not be more than 2 3/4 inches in diameter. 3. The seal must be kept by the governor and used by him officially. The secretary of state must have access to the seal at all times, and may use it in verification of all his official acts. (e) As otherwise permitted by a specific statute.